We are professional window cleaners operating in Kirkcaldy and throughout Fife. We clean windows using several different methods such as traditional window cleaning by hand as well as modern water fed poles and pure water systems. Fife Window Cleaning Services have invested in state of the art equipment to provide the most thorough and effective window cleaning service in Kirkcaldy. This includes heated water in our water fed poles which massively improves the cleaning power when used on glass and frames. Hot water is well known to clean more effectively any number of things. The same applies when used to clean windows, frames, sills and UPVC and the improved quality of our service justifies the investment. Combined with purified water it means when we clean your windows the standard is second to none. We have established ourselves as one of the best window cleaners in Fife because of excellent standards of service at the most competitive prices. Our long reach poles allow us to clean windows several storeys high in flats and apartment blocks and also reach previously inaccessible windows like those over conservatory roofs. We clean all frames and sills as standard for no extra charge. Our window cleaning service is available throughout Kirkcaldy and the KY2 postal area including Chapel, Dunikier Estate, Newliston, Templehall and ALL surrounding areas. Need gutter cleaning services as well as window cleaning? Take a look at our gutter cleaning services in fife. Our commercial window cleaning service is available throughout the region. Our current commercial customers include Gym 64, Cluny Clays as well as care homes, hotels, shops and many other business premises. We are committed to all aspects of Health and Safety and ensuring a safe and risk free environment for those around us. Our use of water fed poles eliminates the need for ladders for added safety and Fife Window Cleaning Services will not disturb your staff, customers or visitors. 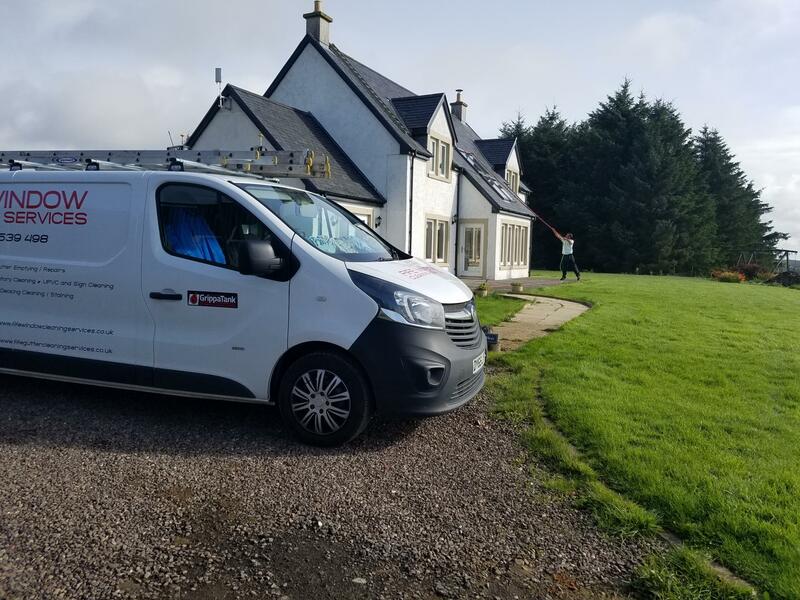 We are fully insured and uniformed operatives drive new, sign written vans making us the smartest commercial window cleaning company in Kirkcaldy and across Fife. Under Scottish law all window cleaners must be licensed by the local council which involves a thorough police check and documentary proof of valid Public Liability Insurance. Fife Window Cleaning Services are fully licensed and insured for your peace of mind and protection.